P.S.R. Engineering College, Sivakasi has advertised in the DINAMALAR newspaper for the recruitment of Associate Professor / Assistant Professor Plus Non-Faculty jobs vacancies. Interested and eligible job aspirants are requested to apply on or before 24th November 2018. Check out further more details below. About College: P.S.R. 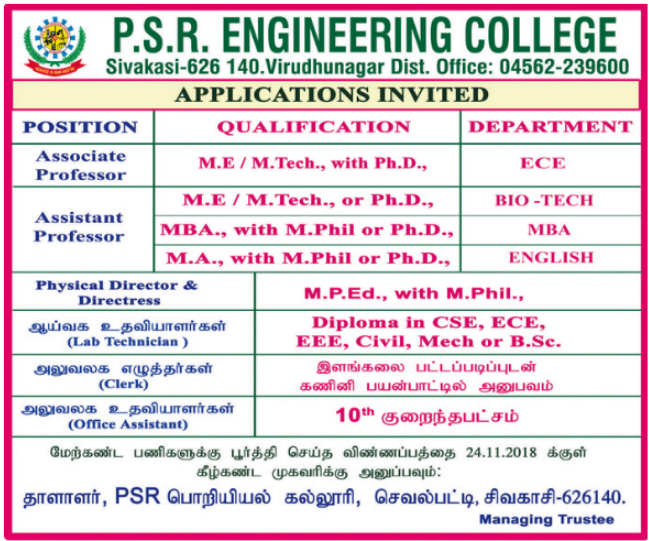 Engineering College, Sivakasi an Autonomous institution affiliated to Anna University is one among the best educational institutions in Tamilnadu and philanthropic institution founded by illustrious sons of P.S.Ramasamy Naidu. It was established in the year 1998 with the noble mission to promote engineering education in backward area of Virudhunagar District. How to Apply: Interested and eligible candidates are required to send application along with CV, copies certificates and mark sheets, passport size photographs to the following postal address.